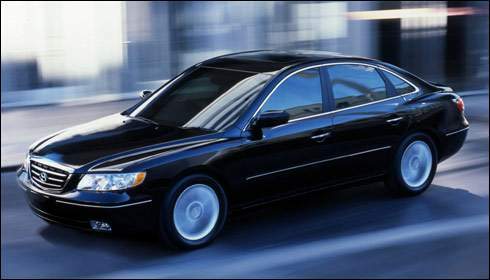 Gary Rome Hyundai Dealer Blog - A Gary Rome Hyundai Site (888) 637-4279: The Avalon of Hyundais! 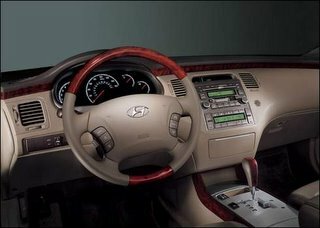 2006 Hyundai Azera. Fuel Mileage (EPA combined): 22.2 mpg Watch out, Toyota, Hyundai has built a better Buick than even you. And watch out Buick, too, while we’re at it. 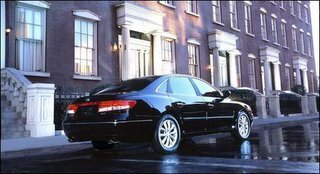 While the enveloping Avalon wheels out of showroom doors somewhere between $27,000 to more than $33,000, the similarly sized and slung Hyundai Azera is expected to start at less than $25,000. And it’s worth it. We drove a couple of Azeras for a couple hundred miles and found them perfectly comfortable and capable. Hyundai calls Azera, “The Next Big Thing.” Get it? ’Cause it’s a big car, see? Hyundai said Azera has more interior volume than not just the Avalon, but the BMW 760i and Mercedes S-Class as well. Though it will mostly compete against Avalon, Nissan Maxima, LaCrosse, Lucerne, Ford Five Hundred and the similar Kia Amani. It rides on a stretched and widened Sonata platform with a fairly curvaceous exterior (curvaceous is in the eye of the beholder, but it looks nicer than the XG350 it replaces). Azera’s 3.8-liter all-aluminum V6 with 24 valves, dual overhead cams and continuously variable valve timing replaces the 3.5-liter from the old XG350. The new engine bumps horsepower from 194 to a formidable (for a V6) 263. Torque twists from 216 lb-ft to 255. With a curb weight just around 3700 pounds, depending on how it’s equipped, Hyundai claims a 0-to-60 time of 6.5 seconds, the quickest Hyundai ever. The latter figure ties with the Avalon. Imagine the grudge matches in the gated retirement communities! All Azeras come with smooth and silent five-speed automatics. Suspension is also all-new, with double wishbones up front and independent multilinks in the rear. A Bosch-designed electronic stability control program helps keep the Azera from exceeding the laws of physics. While we didn’t push it, Azera felt more responsive than its predecessor. The handling is stately, formidable and safe, not lively. It might even be more tossable than an Avalon, though we didn’t drive the two back to back. It achieves the comfortable luxury setup that buyers expect. Inside it was as quiet as a library and lacked nothing you’d expect in an entry luxury ride. Standard features include everything from rain-sensing wipers and power-adjustable pedals to remote locks with engine immobilizer and a power rear sunshade that retracts when you back up. Is this the same company that sold Excels here just 15 or so years ago? Hyundai expects to sell between 30,000 and 40,000 a year, which is entirely doable once word gets out how cushy they really are. And with a 10-year warranty, what’s not to love? What are you looking for, prestige? Buy a hat!